Looking back on this year, several of us have attended a record number of venues in an effort to raise monies for our nominated charity. It commenced in early April, with a day’s demonstration at Felley Priory, when pockets of snow were still evident – and again in July – then a day at the Quakers Meeting House in August, two days at the Moorgreen show, late August and finally a day at the West Hallam Ploughing and Hedge Laying Society held in Risley in September. Thanks to you all, we have managed to raise in excess of £1,000. It doesn’t finish there; we have been invited to attend the Christmas Fayre at Beauvale Priory, a full day event on 1st December. So please recognise that the Chamber Cup rules were changed to allow better opportunities to win, so give it a try. For some of us our thoughts have been towards December and the club’s Christmas Social evening. Details of this evening’s event are highlighted in this edition. Do consider coming along to the final gathering of the year, I am sure you will enjoy the evening. Finally, the writing up of demonstrations for the ‘Turning Times’, can be at times, a bit of a chore. I must however express my thanks and appreciation to those of you who have, over the past months, helped me considerably by ‘volunteering’, and undertaking this task. (Dare I say – long may it continue). 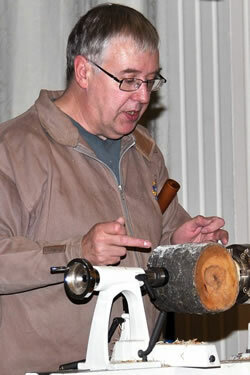 Now – remember whilst woodturning – Health and Safety is not just for industry. 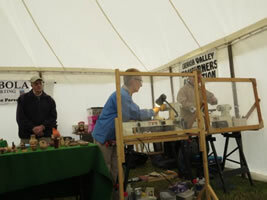 Pat and Trevor doing their ‘TURN’ at the Moorgreen Show during the August Bank Holiday weekend. 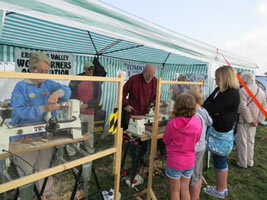 Pat ‘ploughing into a piece’ at the West Hallam Ploughing Match in September. This will be the last Hands On evening of 2013. On the theme of popular items for charity, I suggest we ‘have a go’ at making a few items of fruit, e.g. apples and pears. Bring along a suitable piece of timber, around 75mm cube for apples and 75x75x100mm for pears. I shall provide some jigs (purpose made screw chucks) for use if required. For the stalks, I tend to use short lengths of silver birch twigs. Now that the sap has stopped rising, is the time to cut these. A good idea of Pat and John however is to save the stalk of apples – I may start doing that myself. 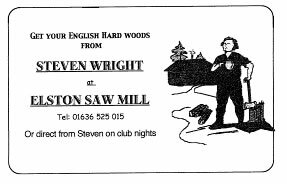 Please remember to bring along your own gouges, etc. The opportunity to sharpen any gouges will be given during the evening. Simon Hope – please note that Simon is now scheduled to demonstrate on Saturday January 25th 2014. To be held on Wednesday 13th November. These are both OPEN COMPETITIONS, i.e. the choice of design and subject is open. The number of entries per person is open. All members are eligible to enter, EXCEPT last year’s Rose Bowl winner. Open to all members EXCEPT those who have won a prize (1st, 2nd or 3rd) in this competition in previous years. Is it true there is only ONE FATHER CHRISTMAS?? Tickets are now on sale from Pat (at the desk). The evening is always a time filled affair, so this year, we shall be commencing the evening from 6.30pm aiming to finish around 9.30pm. The evening ends with the presentation of the 2 competition trophies and prizes. Remember to bring your own glass and bottle of wine/beer. (cutlery and plates are provided). selected by members of the public at our fund raising events. At our August meeting the scheduled Andy Lodge was replaced by David Lowe. David, a first for our club, came along with a very impressive and innovative demonstration. David described himself as having been a turner for 4 ½ years and is a member of the register of professional turners. Wednesday’s demonstration was to be a zippered vessel or zip vase. Start with quarter sawn sycamore. 9 inches long by 4.5 inches square. Mount between centres and turn to round. David gave top tips and guidance on the turning techniques he was using all the way through the project. For example he suggested if you could get your fingers between the tool rest and the piece of work then you should probably move the rest closer to the work! The original inspiration for the project came from a vase that went wrong. The vase split so inspiration was sought for how to salvage the vase and make the best of it even with a split. He has now made more than 200 of these zippered vases. 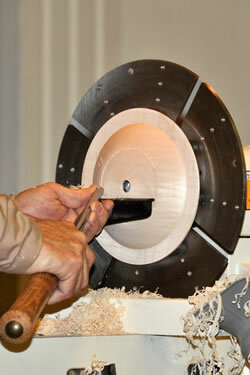 Once the blank is round, true up the ends using a parting tool. Divide the blank into portions, two thirds to one third. One third will be the bottom, two thirds will be the neck and top, with a bit left as waste wood that will be used for chucking. Mark the centre of the top two thirds, this will be the narrowest part. Mark half way in the one third, this will be the widest part. Remember to measure the diameter of the chuck jaws before cutting off too much wood. David’s tip – never force callipers onto rotating wood as it will force the callipers apart giving you a wrong measurement. 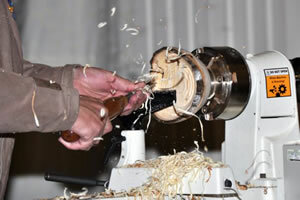 Make the chucking point a good solid chucking point as the hollowing process will be a long way from the chuck. Be sure to dovetail the chucking point for your chuck. If you use a steb centre, if the wood is waxed you need to cut that bit off before using a steb centre as it will slip on the wax. Remount the blank in the chuck. Bring up the tailstock to make sure the wood is properly centred. Tighten up the chuck. Leave the tailstock in place for added stability. Cut in a large cove centring on the lowest point marker. Always cut down hill. The finished cove will be 50mm in diameter at the narrowest point. This will allow for a 40mm forstner bit to drill down the centre. Finished wall thickness will be 5mm. David does a cove half at a time and uses the tool left handed for the left side of the cove. Set the callipers to 50mm. When the cove is partially complete cut down with a parting tool to 50mm. Now use a bowl gouge to complete the cove. Uses a bowl gouge as it is less flexible than a spindle gouge. Uses a spindle gouge for fine detail work. Now move to the base of the vase. David rolls the bottom over rather than cutting in with a parting tool. The aim is to make the bottom look like a ball. Make a steady curve from the marker for the highest point. Now do the same towards the neck. Blend away part of the cove to meet the base. Turn the speed down and power sand. Start the hollowing. Turn the speed the right down. Put a Jacobs chuck in the tailstock with a 40mm forstner bit and drill in slowly. Drill to a depth of about 2 inch – not through the thin section. This is for stability whilst widening the neck. 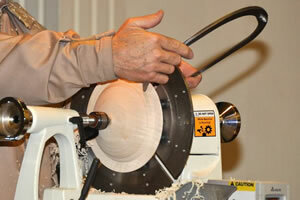 Use careful cuts on the top part of the vase as you are a long way from the chuck. Try to replicate the outside shape on the inside. Once the top has opened up, continue drilling. Try to avoid extension bars as they have a tendency to wobble. David uses a home made VCT tool – a VCT cutter on a long half inch shaft. Normally David hollows out the bottom of the vase with deep hollowing tools. 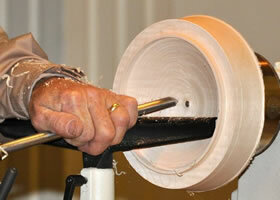 To sand the inside of the bottom of the vase he uses flap wheels on an extension rod. 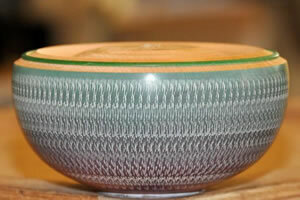 For finishing the vase he uses carnauba wax on a cellulose sanding sealer and a buffing system. For the inside of the vase he does the top section that is easily reached and visible and then uses lemon oil in the rest. £1 zip from Boyes 6 inch with metal teeth. Carefully cut the material off the teeth as close as possible. Then run a blow torch up and down to get rid of the wispy bits. Take the finished vase and lay it on its side. Look for a natural round a v in the grain. This is where the zip will go unless there are any defects in the vase you want to hide. Unzip the zip to exactly half way. 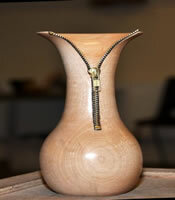 Lay the zip on the finished vase with the top of the zipper teeth on the rim about 2 inches apart. Make a mark on the wood at the bottom of the zip and the top of the closed portion. Draw a straight line between the bottom two marks. Draw a curved V shape from the rim to the closed zipper top mark. Protect the polished wood with masking tape. Carefully cut out a v portion of the vase. 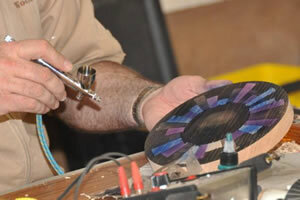 (David uses these cut outs to make curved pendants.) 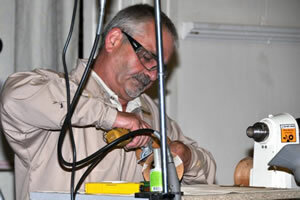 David uses a Proxon tool for the cutting, but a coping saw would also do it, or a dremel type device. Next cut a slot down the drawn line for the closed part of the zipper. The slot needs to be only in the top layer of the wood, not right through it. A quarter inch circular saw blade on a dremel type device cuts the edges of the slot whilst a rotating ball (tungsten carbide) removes the wood in the slot. Cut a little deeper at the bottom of the slot to accommodate the thicker zip end. Cut a little wider and right through at the top of the slot to accommodate the zip slider. Carefully glue in the zip using super glue, medium, with a thin nozzle. Start at the closed end of the zip and glue this half first. Wait while the glue sets before moving on to the open part of the zip. Do half of each side at a time. Glue on the front edge. This allows room for a second line of glue down the back. Do not use accelerators as it has a tendency to dry with a white bloom and may react with the wax finish already on the vase. David then moved on to demonstrate Ukibori. A Japanese technique for texturing wood. Examples of a traditional use for ukibori is in creating netsuke. Ukibori involves using steam. Start by turning your required shape. Now punch into the wood where you want the raised texture to be. 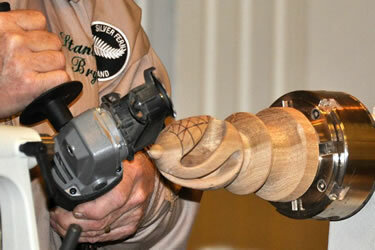 Use something with a round end to avoid breaking the fibres of the wood. Each dimple needs to be punched to the same depth. This can be done by mounting a round ended bar in a drill press then pressing to the same depth into the wood. Remount the work on the lathe. Cut down the wood to the level of the dimples. Sand. Now apply steam. This will raise the dimples of compressed wood. This can produce an effective result if the background is painted with a dark colour and the now raised dimples painted with a lighter colour. This technique works well on wide rimmed bowls. David produced a nightlight holder with the ukibori technique applied. The Japanese used to apply a similar technique in carving to produce lines as opposed to just dots. David was asked about how big these ‘dots’ could be. His reply was that a quarter inch was the biggest he had tried so far. 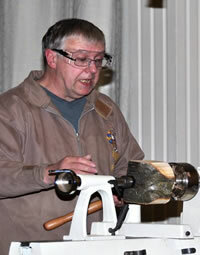 Philip is another newcomer for our club, but is a well known contributor to the ‘Woodturning’ magazine. 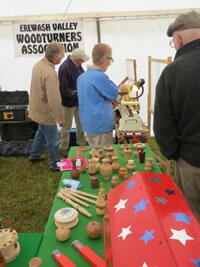 Phil Greenwood gave a very interesting talk and demonstration on green wood turning. First, he discussed about Nails in wood, and how they form in the wood, how quickly they can damage chain saw blades and band saw blades. 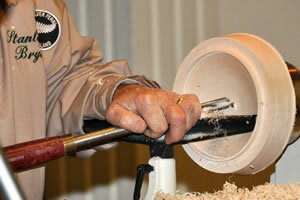 (I normally go over mine with a strong magnet).Phil turned a wet natural edge bowl to start the session. He had already drilled a spigot on the bark side with a Forstner Drill, at a size to fit the chuck jaws. narrow thickness of about 1/8” to avoid cracking during drying. Distortion, however, cannot be avoided. He explained the usefulness of moisture meters, and that the best time to cut wood is late autumn. Someone mentioned Aldi were selling moisture meters. I bought one and am pleased to say that it is dead accurate, much to my surprise for a cost less than £15. Wet wood will be 40% to 60% whereas dry wood will be around 10%. 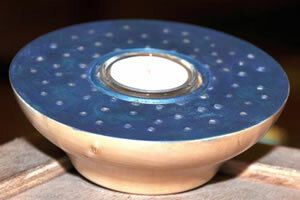 Philip made wood disc with some router matting glued to it so that the outside of the bowl could be ‘reverse turned’ with the tail stock brought up to the base. 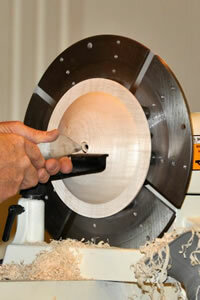 Alternately, to a half turned bowl, in the chuck, place a piece of foam as padding. During the evening Philip turned 2 natural bowls, one side on and the other end on. The speed he used varied from around 400rpm to 900rpm, but it must be emphasised that the speed should be a maximum safe speed with minimal vibration. The ‘Hands On’ evening of Wednesday September 25th, was hosted by Pat Noakes. Pat’s theme was Tea Lights. A good attendance managed to produce 6 excellent Tea Lights for our Charity coffers. A disappointing turnout for what proved to be a very interesting and varied demonstration – with 20 members and 5 guests on the day, the club incurred a loss of £140. Paul started the morning off by turning a cord pull from sycamore. The blank was drilled with a 3mm long series drill and then mounted on a Marlin drive centre which drilled the counters sink hole required. Once turned into a Lighthouse Paul then coloured the piece using Eddy brush pens which are available from Hobby Craft. His view is that felt tips do not work as well as these brush pens. 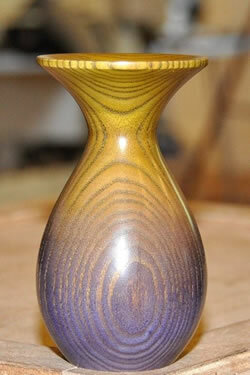 The second project was a bud vase made of Ash. The blank was roughed and a spigot put on one end. The blank was not taken entirely to round as the remounting on the chuck via the spigot would necessitate the blank being trued up again. The blank was remounted, taken to round and shaped. A 16mm diameter plastic insert was to be used so a 17mm diameter hole was drilled to accommodate this. Once done, the lip and the outside were brought to final shape and then sanded to 400 grit. A single action suction feed airbrush – (Paul explained the difference between single and dual action air brushes i.e. single action allows air and paint through when trigger pressed whereas dual action allows air through on first press and paint through when trigger drawn back) – was then used to apply Chestnut spirit stains to the bare wood whilst the piece was rotating. The piece was then sprayed with acrylic sanding sealer and once dried cut back with wire wool and some coloured wax then applied to highlight the grain. The vase was parted off and the nib on the bottom removed by using a 2 inch sanding disk mounted on an arbour made to fit in the chuck. 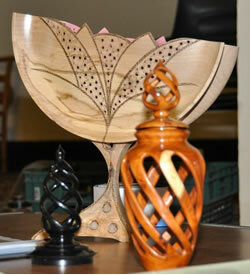 The third project was again an Ash bud vase which was brought to shape in the same manner as the first. However, on this vase he showed a technique very difficult to describe! He beaded the vase using a technique that used a spindle gouge which was used to cut a groove at the bottom and with a sort of circular motion made a bead and then cut the next groove. He used this in a continuous motion to make beads all the way to the shoulder of the vase. Paul then used a blow torch to scorch the beaded area to burn off any wispy bits. 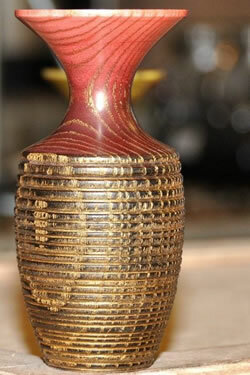 He then used the airbrush to apply black stain to the beaded area and red stain to the neck area of the vase. Gold wax was applied to the whole length, finished off with sanding sealer and then parted off. 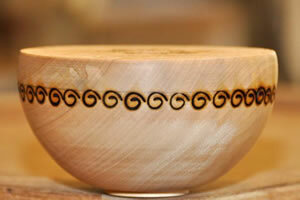 The fourth project was a bowl made from Acacia wood. The blank was mounted on screw chuck and the bottom shaped and finished ready for reversing ensuring the centre was marked. Paul then applied a coat of Gesso (an artist’s primer) and used a hair comb to put a texture in the gesso layer. As the Gesso takes about an hour to dry Paul then adopted the ‘Blue Peter’ strategy by getting a piece on the lathe that he had prepared earlier. This time using a Dual action Gravity feed airbrush and acrylic paints, (Createx), he sprayed the textured Gesso surface with green blue and purple paints graduating one into the other. Once happy with the affect the piece was sealed with satin acrylic sanding sealer. 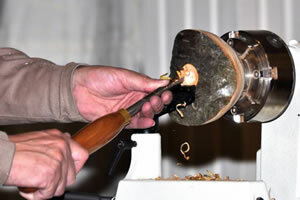 The bowl was then reversed by using a wooden dome in the chuck with a non slip mat and bringing the tail centre up to the centre point previously marked. The waste was removed, the bowl removed from the lathe and the bottom finished using the chuck mounted 2 inch sanding disk. 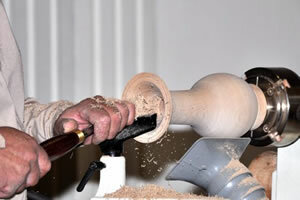 Showing the affect obtained by applying too much pressure to the tool which makes it bounce on the wood. 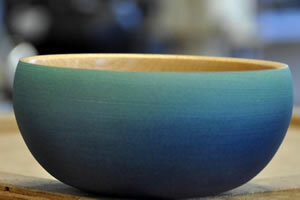 The sixth demonstration was a decorated bowl. Paul turned the base of the bowl and finished it. Then used a Sorby texturing tool to put a texture on the bowl, and using the airbrush he sprayed the bowl red and green. When dry the bowl was sealed with sprayed acrylic sealer and then liming wax used to fill the indentations made by the texturing tool. The 7th demo was a small Maple bowl which he used to show the affects made by using a homemade spiral tip to a pyrography machine. He made a pattern all the way around the top edge of the bowl with this tip. Whilst using the pyrography machine Paul also showed how a tip made from a a horizontal coil of wire could be used to give a latticework affect. This was added to by using Jo Sonja’s acrylic paints. The final demonstration was showing how he created his award winning patterned platter. He used a round piece of flat Oak for the demo. He marked out radiating segments on the wood and then marked off these sections with broken stepped circles He decided on how many colours he was going to use and then marked off each of the segments with a number representing the colour that was to be used. Once Paul had the design he wanted marked on the wood he used something called frisket film which stuck to the wood but could be easily cut and peeled away from the wood. Paul used a sharp knife to cut the film all along the lines that had been marked up on the wood. Then he removed each section of frisket film that covered the segment with the first colour He used his airbrush to spray the first colour onto these segments. (Always start with the darkest colour as overspray of light on dark does not impact the result the way dark on light would). He then removed each colour segments in turn and sprayed them with the appropriate colour. He then finished off with a sealer. He advocated spraying acrylics onto bare wood in the same manner as stains and seal afterwards. This was a very concentrated and busy session which many may have some issues tackling. Paul started this last demo 30mins before the end and managed to finish the piece on time! A very good day’s demonstration – well worth seeing. a split turned platter inspired by Bob Chapman. 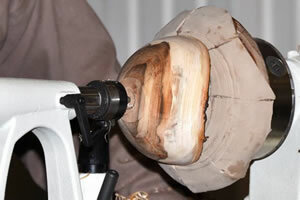 Stan started with a turned finial which had been marked out and partly cut. His personal preference was Yew as one of the best woods to use for these finials, and Holly is a good alternative, but any close grained wood is fine. It is important to finish the top of the finial before commencing the cutting out of the vines. There would be no going back to re-shape the top once the cutting out had been completed. Correct marking out for the vines is critical. The length of the vines can be marked first by simply drawing two lines around the circumference of the finial to represent the top and bottom of the extent of the vines. 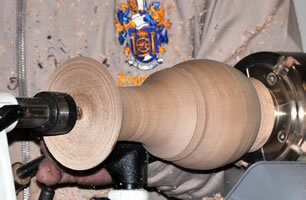 (Note that these lines would be horizontal once the finial was off the lathe and in its final vertical position.) Another line half way between top and bottom can be added to the circumference. Then further lines can be added as required as long as there is an equal spacing between all lines. Next you need to determine the number of vines required and use the lathe indexer to draw a horizontal line between the two top and bottom lines ( i.e. along the axis of the lathe using toolrest at centre height.) The number of horizontal lines will be equal to the number of vines required and distributed evenly around the 360 degrees. e.g. with a 24 indexer and 4 vines required then use 1, 7, 13 and 19. It was not advisable to decide to require 5 vines. These lines now form a grid structure spread around the 360 degrees. The “steepness” of the vines is a personal preference but it may help to envisage the grid as a piece of graph paper, the top of the vine is represented by the cross connection of horizontal and vertical grid line . The vine is a straight line between top and bottom and the angle or steepness required for the vine will determine which intermediate crosspoints are connected together. Draw these lines for each vine. Then using a different colour, say red pencil, mark the width of the vine equal distance either side of the vine line. These red lines now identify where to start cutting. Before any cutting starts make sure the lathe is turned off and unplugged. It is a good idea to delineated the top and bottom of the gap between the vines by drilling a hole. Position finial so that the hole can be drilled at centre height and at right angle to the axis of the lathe. 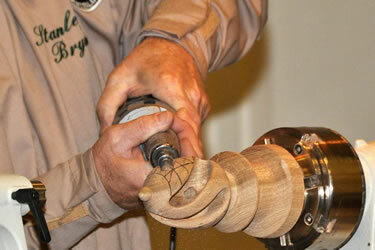 Drill into centre of finial. This will ensure that vines appear to be of equal length. To remove the wood between the vines start by cutting along the red lines joining to the holes just drilled. 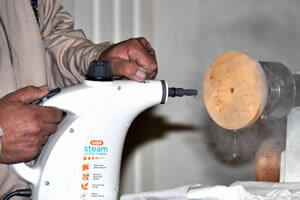 Stan used the small Arbortech cutting tool, but other methods can be used as preferred. Stan then used a De-burrer tool to remove the wood between the cut lines. When removing the wood behind the vines it is important to do this in even steps such that each vine reduces in thickness by equal amounts. This avoids over-stressing the thinnest vine. As an alternative to the De-burrer a Dremel can be used. To finish the vines long strips of sandpaper, half inch or three eights width, are used. Can start with 80 grit. Need to be careful with the finer vines, sanding with the grain puts much less pressure than sanding across or against the grain. For the outside of the vines sanding backed by a stick was used to keep the outside of the vines flat. Finish sanding with the grain also avoids leaving scratch marks. Remember that the “Golden” rule for finials is no more than one third to a half the height of the vessel. 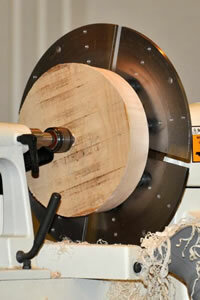 Stan started with an 8 inch diameter by 2 inch thick piece of Sycamore, which had been cut on the bandsaw. It was mounted on a screw-chuck and the hole for the chuck had been drilled all the way through. The outer edge was trued up to round using a bowl gouge and a draw cut coming in from the front surface side to avoid bouncing on the flats. The cut was stopped about an eighth of an inch before the back surface in order to avoid grain breakout, the front surface was also trued up via a push cut with bevel rubbing. Cut the depth of the lip using a one eighth parting knife. 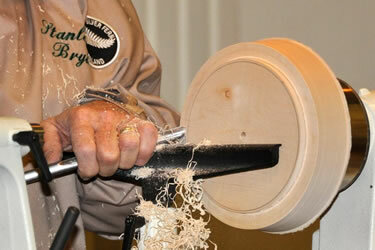 Cut the outer shoulder using a bowl gouge. It is important that outer lip is cut to form a square edge since this is where the Cole Jaws will bite. Cut the depth of the inner edge of the lip again using parting tool and ensure it is the same depth as the outer part of the lip. Aim for lip thickness of 5mm. The inner surface of the vessel can now be shaped. Draw cuts from the centre out to remove the bulk. Bevel rubbing push cuts from lip to centre to finish. Use the screw chuck hole to gauge the depth required and aim for a “nice even arc” from inner lip to centre. It is important to ensure top surface of lip is true and square since this will form the surface for final gluing of the split vessel. 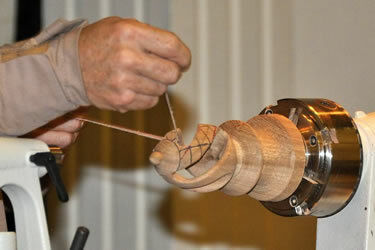 Stan used a thin flat piece of wood with sandpaper pressing across the full width of the diameter. Sand through the grits in the usual way in order to finish the surface of the inner wall. Apply any colour if required. Reverse the vessel mounting onto the Cole Jaws and introduce the tail-stock for safety. Remember that the lip is only 5mm thick so don’t over-tighten. Carefully shape the outer surface of the vessel; using light cuts in order avoid excessive pressure on the holding lip. Check the thickness of the wall frequently. Stan has found that the Simon Hope calipers work well in this situation. Aim for a wall thickness of 5 mm. Cut away the outer edge first leaving bulk in centre for added strength while the outer is completed. As the wall becomes thinner it will begin to sound hollow. To shape the centre area of the wall, the tailstock is removed and the screw chuck hole enlarged a little. This helps to gauge the wall thickness for the final cuts. Remember that this hole can be incorporated into the final shape of the split vessel wall. Remember to sharpen tool before final cuts. Final cuts are push cuts from the centre outwards. Fine cuts are required until the desired wall thickness is achieved. Sand through the grits in usual way for desired finish. Remove from chuck. Cut in half along the centre of the grain. PowerBond 86 glue provides a little more work time than super glue while not requiring any clamping. 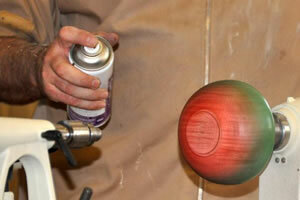 Stan finds that spray acrylic lacquer provides a good finish where much handling is expected. Off-centre turning is always going to create vibration on the lathe; the more the off-set, the greater the risk of increased vibration. To ensure your lathe is sturdy enough to handle vibration, apply heavy blocks on the lathe stand or better still, bolt the legs into the workshop floor. As is the case for all turning, it is essential that tool rest clearance is checked, check tool rest and banjo for tightness and the tail stock, if used, for tightness, before starting the lathe at minimum speed. A variable speed controller is ideal under these circumstances for gradually increasing the speed to the most suitable. Wear suitable clothing and eye/face protection at all times. Use large size gouges that are strong enough to handle the punishment offset turning will give. Always keep hands and fingers behind the toolrest. Recognise that the work piece, when spinning, will only be seen as a shadow at the extremities. Always stop the lathe before making adjustments to tool rest, etc. 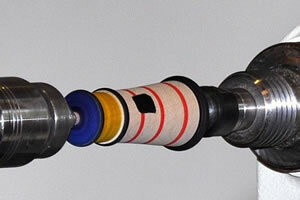 Sanding and applying finishers should always be carried out with the lathe switched off.